Back in my college days I was a vegetarian. I mean, who wasn’t a vegetarian for at least a little while in college though, right? I grew up in a strictly meat and potatoes (and dessert every night) kind of family, so straying from that formula was definitely a learning experience. I was on my own for the first time and I wanted to express myself as the “independent” young adult that I was… or something like that. I think that out of my whole family my grandmother had the hardest time wrapping her head around my new dietary choices. I mean, most of the family was sort of just like, “why?”, and rolled their eyes, but the first time I went home for Thanksgiving my poor grandmother was completely beside herself. This was well before the bacon-ization of America and most of the sides at the table were totally vegetarian friendly, so I bellied up to the table and piled my plate high with squash and beans and potatoes and biscuits and corn and all sorts of amazing things. Grandma just couldn’t (or wouldn’t) accept that I was satisfied or full without having turkey and stuffing and gravy. She kept asking if I was okay and offering to go get me something else to eat. Personally though, I was thrilled with all the different sides and it was one of the best meals I’d had in a long time. Grandma wasn’t buying it though. Back at college I was doing my best to try new things, and was eating all sorts of things that I was unfamiliar with up until that point. Crispy fried bean curd (basically general tso’s tofu) was one of my new favorite things at the Chinese restaurant on Main St., and a vegetarian chili made with TVP or “texturized vegetable protein” at the neighborhood health food store was a lunchtime staple in my diet. I also ate a lot of BK Whoppers without the meat. No veggie burger, just a Whopper with no meat. Don’t knock it till you try it. One thing that I never quite got into though, was lentils. Something about lentils just conjured images of dusty old hippies gnawing on sprouted mung beans in some commune somewhere. While I was actually really into Phish and the Grateful Dead, the lentils (and the mung beans) didn’t appeal to me. It wasn’t until much later, after meat found it’s way back into my life, that I tried lentils. 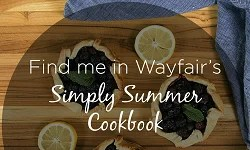 My years as a vegetarian taught me a lot about how to make a tasty & filling meatless meal, and that I should always be open to trying new things. There was a time shortly after I moved to Brooklyn when I was out of work for a little bit and a good friend found herself out of work at the same time. We decided to save money by cooking big cheap meals together that we could share and eat for a few days. 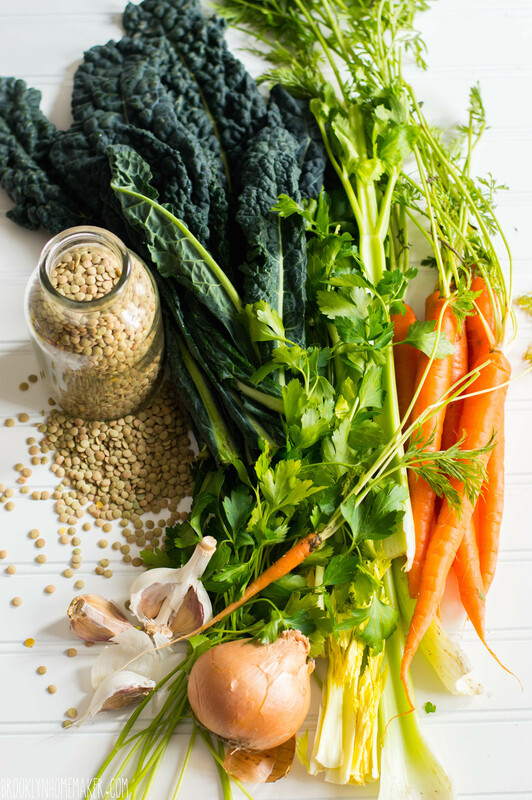 We came across a recipe for a pureed french lentil soup, and given that lentils are like a buck a bag, we decided to go for it. 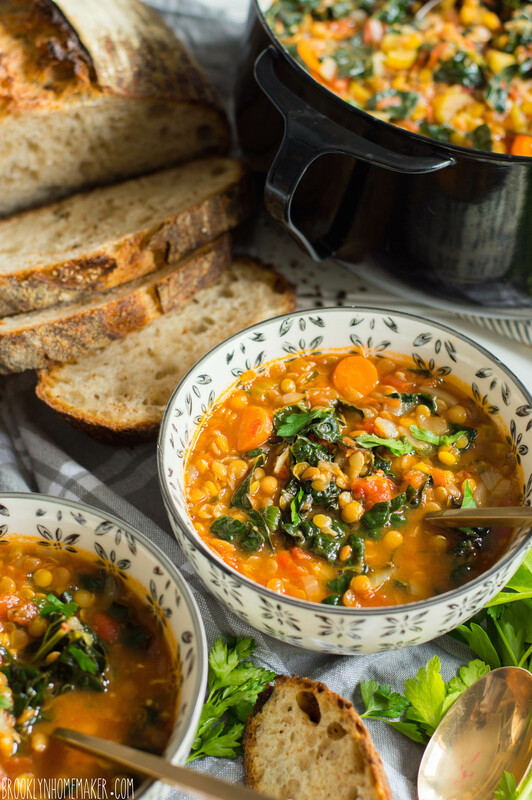 It was love at first bite and for years that was my go to lentil soup recipe. Lately though, I’ve been wanting to try something different. Something new. 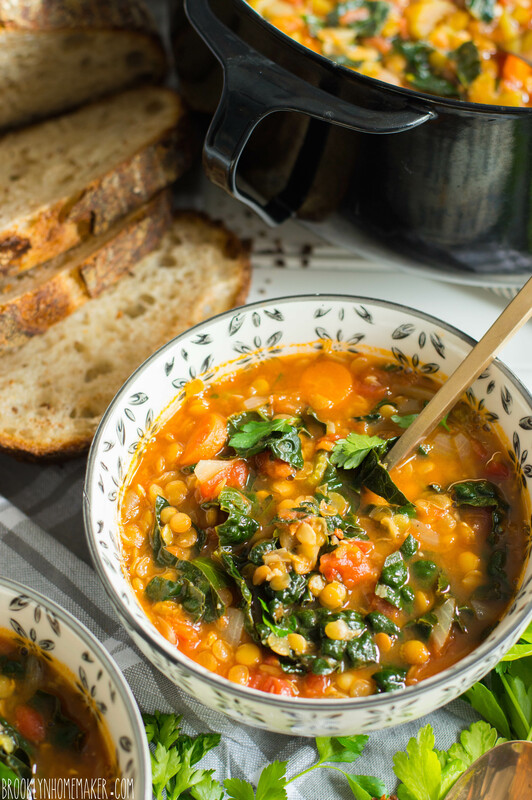 I figured that I might add some diced tomatoes to the soup for a bit of brightness and acid, and throw in some lacinato kale for texture and color and to make the soup feel even healthier and more substantial. This is just the kind of thing I crave this time of year. A hearty, healthy, filling soup to warm my old bones on a cold winter night. 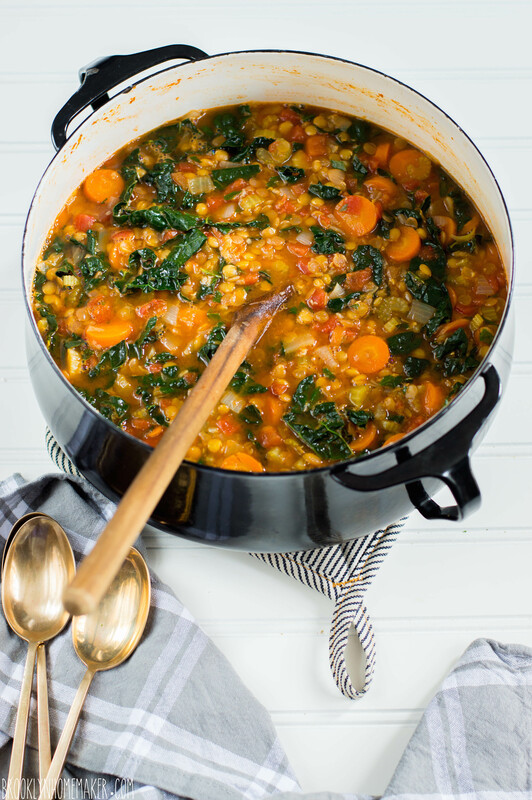 Tender veggies, earthy al dente lentils, chewy dark green kale, bright acidic tomatoes, a bit of heat from the chili flakes, and fresh green parsley. Just perfect. While this soup would probably fall under the “healthy” category, I promise that it doesn’t taste like health food. 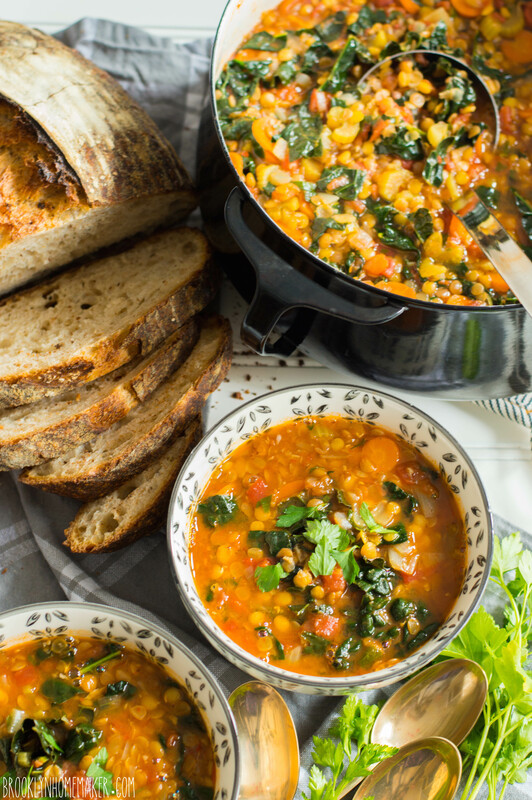 No dusty hippie communes here, just bright, delicious, hearty soup. 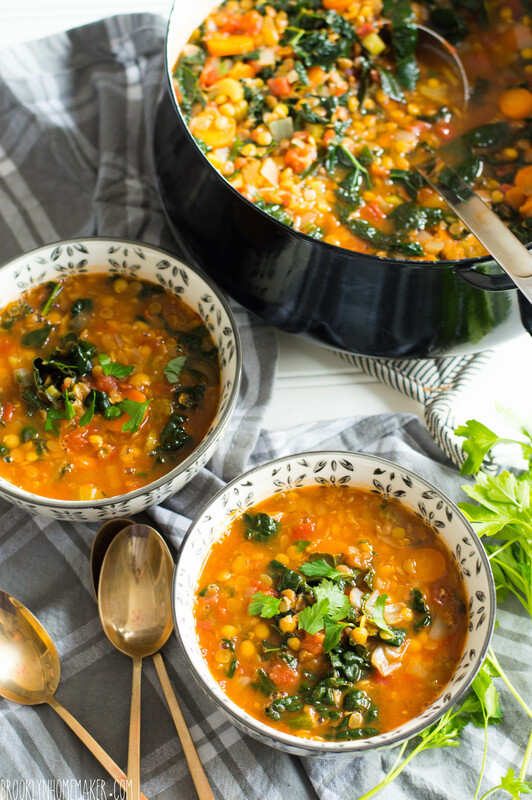 And even though this soup is technically vegan, you won’t miss the meat at all. 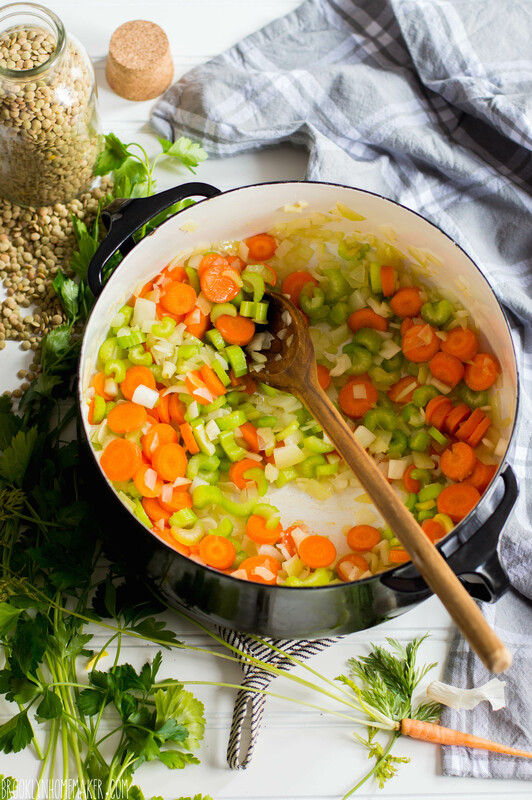 This soup is so thick and hearty it’s practically a stew! Heat olive oil over medium high heat in a large heavy stockpot or dutch oven. Add onions, carrots, and celery, & season with salt and pepper. Sauté until onions are soft and translucent, about 5 minutes. Add garlic and sauté one minute more. Add tomatoes and simmer for about 5 minutes to concentrate their flavor. Add lentils and stock and bring to a boil. Reduce heat, cover, and simmer for 25 minutes, stirring occasionally. Add kale and parsley and simmer 5 minutes more. Check that lentils are tender. Add vinegar, taste, and adjust seasoning if necessary. Serve with a sprinkle of fresh parsley and some nice crusty bread. A bit of parmesan cheese could be a nice touch too. So according to the name up at the top of the page, I do most of my cooking, baking, home improvement projects, and general homemaking in a little known town called Brooklyn. You’ve heard of it maybe? I’m not sure how familiar most of you are with the different neighborhoods in Brooklyn, but the area where I live is called Bushwick. Bushwick is pretty much as far north as you can get before accidentally crossing over into Queens, and by subway it’s only a few stops away from it’s bigger, wealthier, more popular sister neighborhood Williamsburg. When I first moved to Brooklyn in 2007, Williamsburg was still a growing artist community and Bushwick was an industrial no mans land that hadn’t yet been invaded by more than a handful of hipsters. In those days Williamsburg was still (almost) affordable, and was still home to art galleries, dive bars and record stores, but a good friend of mine had a place in Bushwick and let me crash until I got on my feet, so I landed in Bushwick and never left. In the years since, Williamsburg has become a playland for the rich and famous and one of New York’s biggest tourist destinations. Thanks to rising rents forcing young people further out, Bushwick was recently named one of the hippest neighborhoods in the world by Vogue Magazine. In 2007 Bushwick was a very different place. It was one of the most affordable neighborhoods in Brooklyn, which I why I stuck around, but it was also dirty and dangerous and filled with just as many junkies as it was rats. We’ve gone from dead rats and pepper spray to baby strollers and art galleries. Abandoned buildings and needle exchanges to luxury condos and organic food co-ops. If I hadn’t found a rent stabilized apartment a few years back I probably couldn’t even afford to live here anymore. Bushwick has always been a neighborhood in transition, since the very beginning. Originally a farming community, in the 1800s Bushwick grew into a beer brewing hub filled with German immigrants, their breweries, and their huge mansions lining Bushwick Avenue. Prohibition eventually shuddered most of the breweries though, and by the 1950s Bushwick had become one of New York’s largest Italian neighborhoods. Big changes came again as post war white families flocked to the suburbs and were replaced largely by Puerto Ricans immigrants and African Americans. 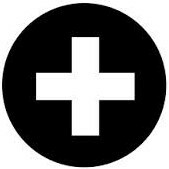 According to US Census records, in just one decade Bushwick’s caucasian population dropped from over 90% in 1960 to less than 40% in 1970. Thanks to the energy crisis of the 1970s and the closures of most of Bushwick’s industry, the neighborhood was quickly overrun with crime, drugs, abandoned buildings, and urban decay. Bushwick was one of the neighborhoods hardest hit by riots and looting during the New York blackout of 1977, forcing even more businesses out of the area. Things didn’t improve any during the 1980s and 90s, but by the late 2000s things finally started to turn around as Williamsburg artists flocked in to take advantage of the neighborhood’s low rents and large loft spaces. I’ve been here for about 8 years and I’ve seen things change so quickly and completely it makes my head spin. I can’t even begin to imagine what this neighborhood will look like in another 10 years. One of the easiest places to visualize all this transition first hand is Graham Avenue. Cultures literally clash as streets signs on Graham Ave declare “Avenue of Puerto Rico” south of Metropolitan Ave, but suddenly change to “Via Vespucci” north on up to the BQE. Avenue of Puerto Rico is populated with cheap clothing stores, Iglesias, and Puerto Rican beauty supply shops; but cross Metropolitan Ave and it feels like a whole different neighborhood dotted with Italian restaurants, pizzerias, and wine shops. Russell recently heard about an old Italian butcher shop on the Via Vespucci side of Graham Ave called, appropriately enough, The Pork Store. He paid them a visit on his day off and brought home some of the best Italian sausage I’ve ever tasted, along with a gorgeous bag of imported Orecchiette. 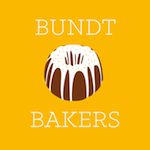 I knew I wanted to make something amazing to put his Bushwick bounty to good use, but knew I had to keep it simple enough to let these superior ingredients shine. All I needed was a big bunch of broccoli rabe, sometimes called rapini, and a bit of nice dry white wine. 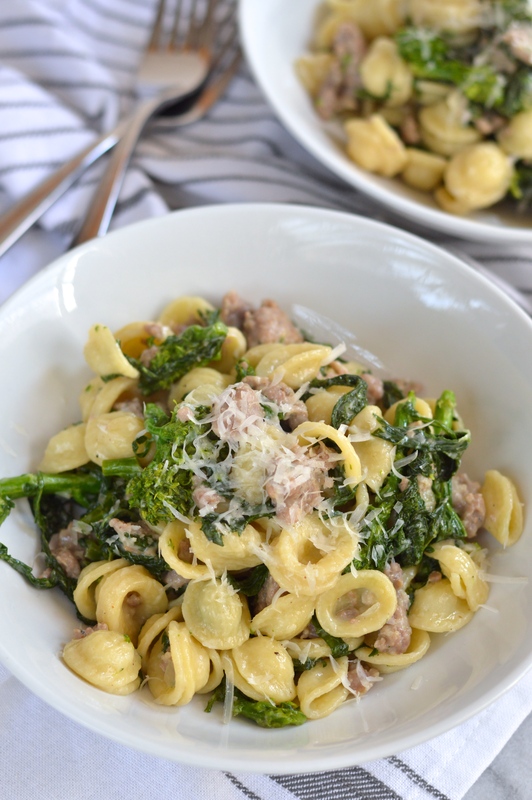 Broccoli rabe has a grassy bitterness that stands up really well to the unctuous richness of sausage and cream. 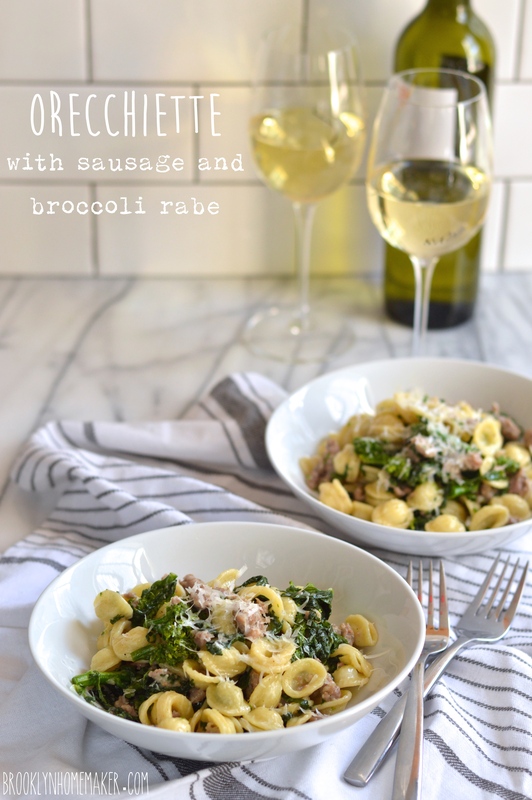 White wine adds just a touch of sweetness to counteract the bitterness of the rapini, and al dente Orecchiette is nice and thick and adds great texture and happens to be the perfect bite size. 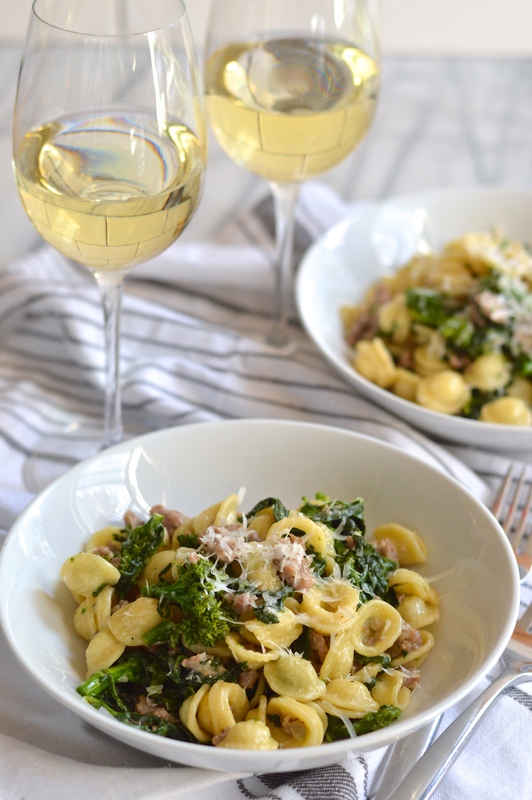 A bit of cream gives the reduced white wine a bit of saucy body, and a handful of salty grated parmesan cheese brings everything together. 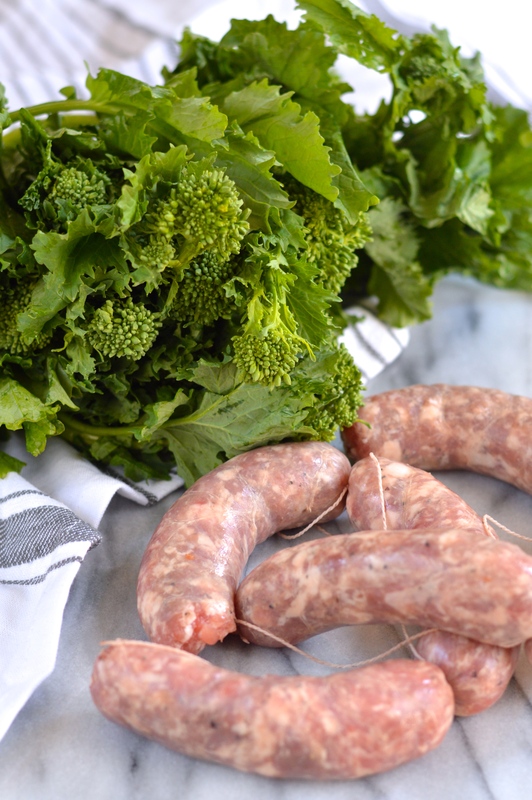 If you don’t have access to a local Italian butcher shop, just get the freshest and best Italian sausage you can find. 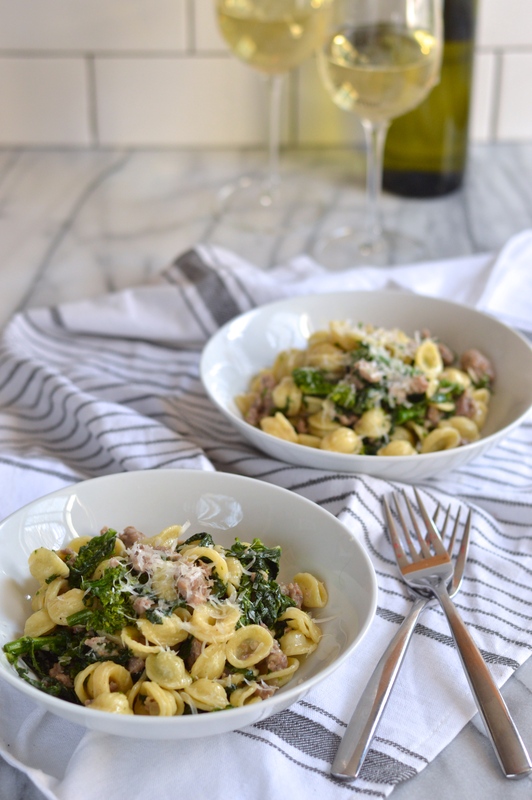 If you can’t find orecchiette, any bite sized thick cut pasta, something like penne or bow ties, will do just fine. This dish is simple, delicious, and perfectly satisfying. The best part though, is how quickly and easily it comes together if you start cooking at the same time you bring the pasta water to a boil. 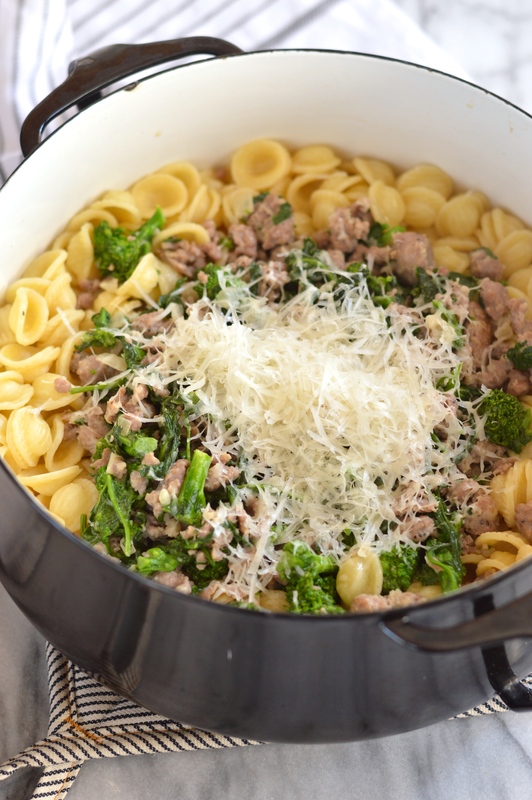 Everything else should be done just in time to drain the pasta and all you have to do is toss it all together and dig in! 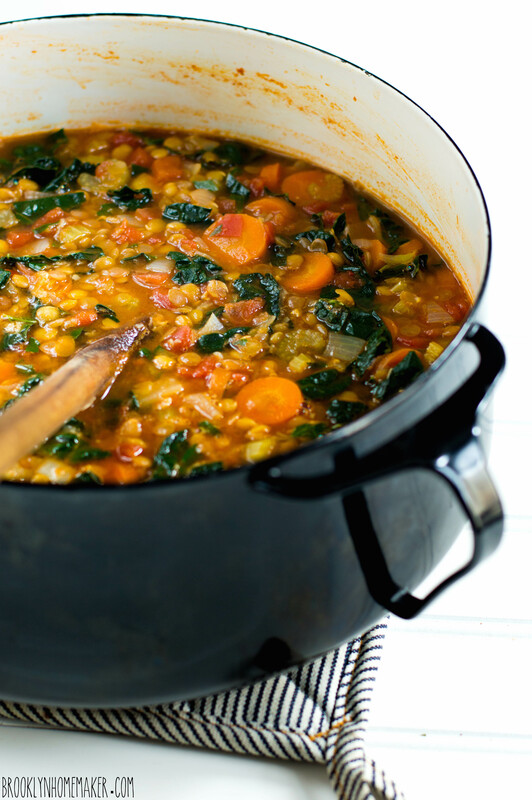 Bring a large pot of salted water to a boil on one burner while you prepare the rest of the meal on another. Heat olive oil in a large skillet. Sauté onion until soft and translucent, about 5 minutes. Add sausage and break up with a spatula or spoon as it cooks. Once the sausage is fully cooked, add half of the white wine and reduce until almost completely dry. Once reduced add the remaining wine and reduce until almost dry again. Remove thick woody stems from broccoli rabe and discard. Roughly chop or tear the leaves and heads into large bite sized pieces. Cook pasta to al dente according to package directions. 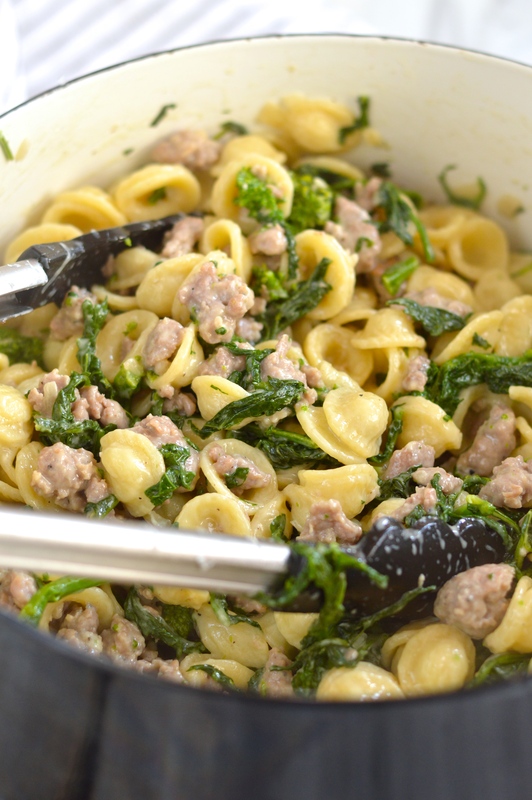 Meanwhile, add heavy cream and broccoli rabe to the sausage and onion mixture and cook until dark green and wilted through, about 3 or 4 minutes. Add about a half cup ladle of pasta water and reduce for about 5 minutes more. Taste and see if seasoning needs to be adjusted. (I didn’t need to add any salt because my sausage was salty enough for the whole dish.) 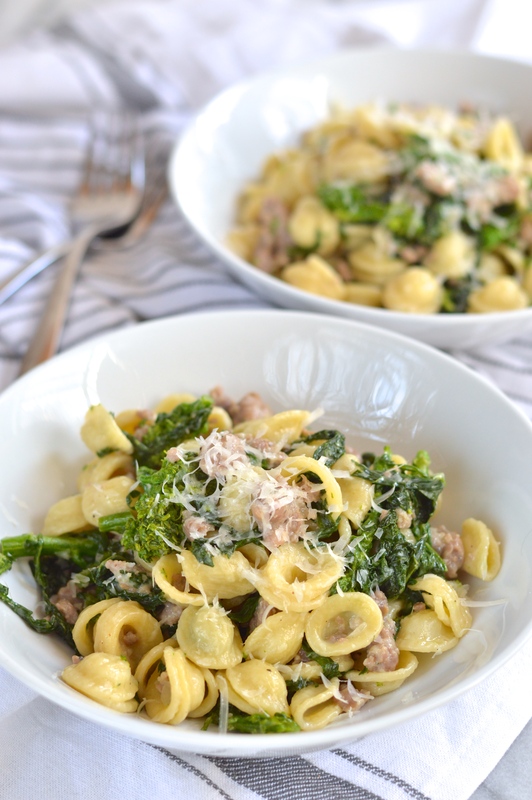 Drain cooked orecchiette and combine with sausage and broccoli rabe mixture. Add grated parmesan and toss toss toss until well combined. Serve with an additional shaving of parmesan if desired.